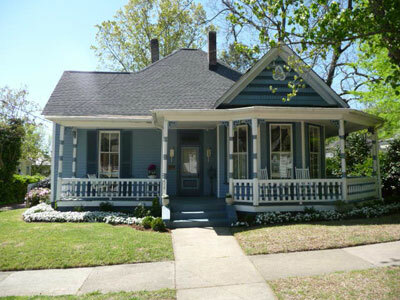 Moore, a merchant and cotton broker, built this Queen Anne-style cottage which features a cutaway bay window and a wrap-around porch with turned columns. The J. T. Moore House, c. 1893. This elegant renovated home, with its long central hall, formal rooms and library is a frequent Triangle gathering-place for musical, political and neighborhood groups. A southeast facing sunroom, and a wrap-around porch in front and deck in back overlook a large 0.29 acre lot with a large brick patio/parking area. The 3 BRs include 2 on the 1st floor, one a true master. The versatile upstairs BR and adjacent hobby room could be a rec or family room. New heat & air in January 2011.